Today I'm sharing a bright and cheery card I created using distress oxide ink. I had fun experimenting with the colors and trying a crinkled background technique. Side Note: I wanted to put a plug in for my favorite Etsy store. for less $$ - you'll want to check out PerriAnnsArtsNThings. and they always go above and beyond! I purchased both of the stamps used on this card there. Lovely card and possibly without realising you also have layers and lemon on there. I like the way you created your crinkled background. Thankyou for coming and spinning the butterfly wheel for this challenge. Hugs Mrs A. Such a pretty background and neat technique, your flowers look great against it and love the butterfly border inside! What a fun background, I haven't done this one in a really long time so I think maybe you have inspired me. Very pretty card. Great use of the distress oxide inks. Thanks for joining us this week at Word Art Wednesday. Gorgeous background - it makes me want to play now too! 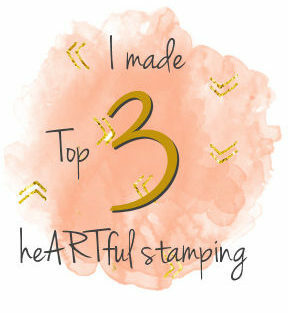 Congratulations on making Top 3 over at my heARTful stamping challenge this week. Please visit us again! I like the way you used the stamp to let the beautiful background show though! Thank you for joining us at the Heartful Stamping Challenge!